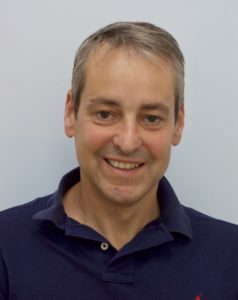 Nigel Roe is a New Zealand physiotherapist with 27 years experience and a special interest in sports injuries and orthopaedic rehabilitation. He qualified from the Otago School of Physiotherapy in New Zealand in 1990, and went on to complete a postgraduate diploma in manipulative physiotherapy at Otago University in 1993. This additional 1 year full-time course focused on specialising in the diagnosis and treatment of spinal and limb musculoskeletal problems. In 1995 he was selected to join a specialist New Zealand management team to boost an ailing Fiji Rugby Union's fortunes, and toured extensively internationally with the Fijian national side over the next 4 years. During this time he was recruited to help Saracens UK premiership rugby team's progression into the professional era. He was medical team leader at Saracens from 1999 to 2004. Nigel started his own London based private clinic setting in 2004 and spent 13 years based initially at Triyoga and The Laboratory spa & Health Clubs in Muswell Hill & Mill Hill. A family relocation to Solihull in 2010 resulted in 7 years commuting back to London to base solely at the Laboratory Spa & Health Club in Muswell Hill. In addition to sporting injuries, he assesses and treats a wide range of occupational, post surgical and personal injury problems in all age groups. He has vast experience dealing with pre and post operative rehab for joint replacement surgery and trauma surgery, and is very familiar with pregnancy and post pregnancy back and postural pain. Injury prevention including running video analysis, running shoe assessment and advice, muscle imbalance/functional movement screening and postural assessment are also available. Education to help you understand your injury/problem, and exercise to address contributing flexibility, strength and faulty movement patterns are key components to this preventative approach. A closely supervised and structured rehabilitation exercise programme, where appropriate, is prescribed for home and/or gym setting as an integral part of treatment. Nigel’s treatment techniques are principally “hands on”, using joint mobilising and manipulation techniques, muscle, soft tissue and trigger point release techniques that can be used to relieve pain, reduce painful protective muscle tightness, restore joint movement and lengthen tight muscles. Leaving London...and finding Virgin Active Solihull! Nigel's wife Kirsty is a Veterinary internal medicine specialist, and her professional career development led to a move to Solihull in 2010. Nigel & Kirsty moved from London to Solihull at that time , but Nigel continued to commute back to his busy North London Practice for the next 8 years. The arrival of two children over the last 4 years made the extensive time away from home challenging, and in mid 2017 Nigel made the difficult decision to "close shop" in London to look into relocating clinical practice to the local area. A long search for a suitable clinic location has led to James Walsh and the team at Virgin Active Solihull....an amazing gym with fantastic facilities and a very switched on personal training team headed by Luke Smith....the perfect base for building an orthopaedic rehabilitation based clinic! To make a booking to see Nigel for an initial 1 hour consultation, click on this button to link directly to his live online appointments diary. All appointments confirmed by instant email with a link to change or cancel if required. Please email nigel@nigelroephysio.com or call 07957630877 if you have any questions prior to booking an appointment.